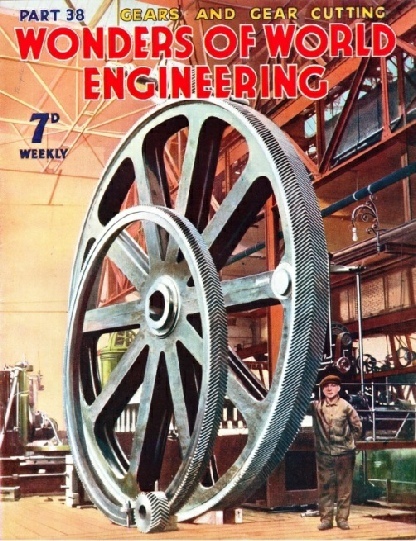 Part 38 of Wonders of World Engineering was published on Tuesday 16th November 1937, price 7d. An unusual subject has been chosen for this week’s cover. 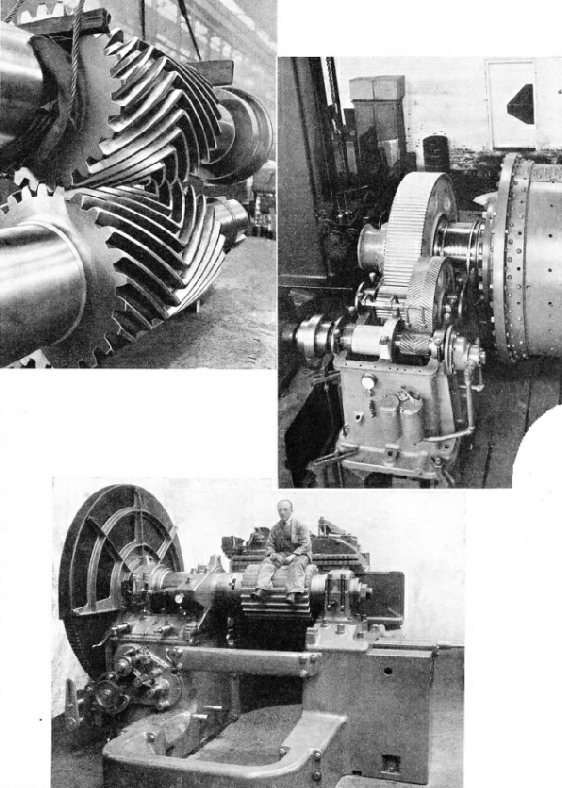 The photograph shows a set of immense gearwheels, whose size gives a good indication of the scale of modern engineering. These wheels, of cast steel, were designed for a large crane and were made in a German steelworks. The largest wheel in the photograph has a diameter of more than 16 feet. The double helical, or herringbone teeth were cut after the wheels had been cast. This process is described in the chapter Gears and Gear Cutting in this week’s Part. 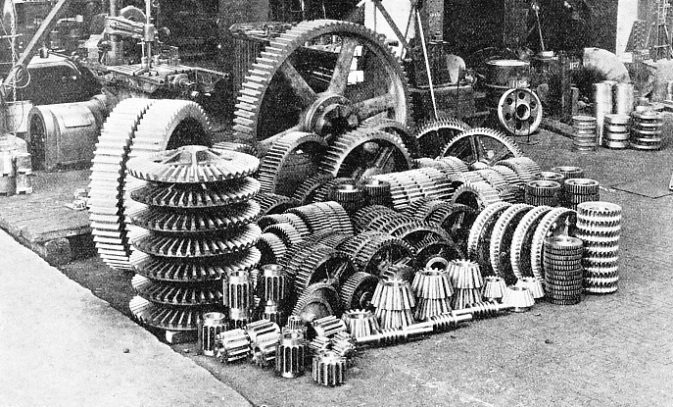 S T Martin-Bulmer and describes different types of gears used in engineering and the various ways in which gearwheels are cut. It is appropriate that artists should choose the gearwheel, or cogwheel, as it is sometimes called, as a general symbol of the engineer’s work. It represents the transmission of power and is used in almost every form of machine. The gearwheels of a watch or of a motor car are familiar to everyone nowadays, but few people who are not themselves engineers understand how these vital parts are made. The operation of the various cutting machines are described and illustrated in this chapter. MACHINE-CUT STRAIGHT TOOTH GEARS awaiting assembly in machines. Towards the back of the group are spur wheels of the ordinary and of the bevel types; at the front are ordinary and bevel pinions. In front of the bevel pinions are three worms, which are used to drive the curved-face worm wheels seen on the right. The use of concrete in engineering is exemplified by dams, bridges, tunnels, roads and buildings all over the world. The manufacture of Portland cement, which is used in making the concrete, has become a vast industry in which many spectacular processes are involved. Cement and concrete are perhaps the most common of the materials used by engineers in the construction of the world’s great dams, docks, tunnels, roads, buildings and the like. Cement is artificial rock, with a strength and imperviousness far superior to many kinds of natural rock. The Romans were great engineers and they used various kinds of concrete and cement; but cement as we know it to-day is one of Great Britain’s contributions to engineering. In Great Britain excellent natural conditions for the manufacture of cement exist in the estuaries of the Rivers Thames and Medway. Here there are great ridges of chalk which descend to banks of clay and mud by the water. Thus the two main constituents of cement are at hand. The raw materials are first mixed in correct proportions and calcined in great rotary furnaces or kilns. The calcined material is then fed through various kinds of grinding mills and stored in huge silos or storage bins, ready for delivery to engineers by rail, road or sea. This, briefly, describes cement-making processes. A detailed description is given in this chapter by F E Dean. 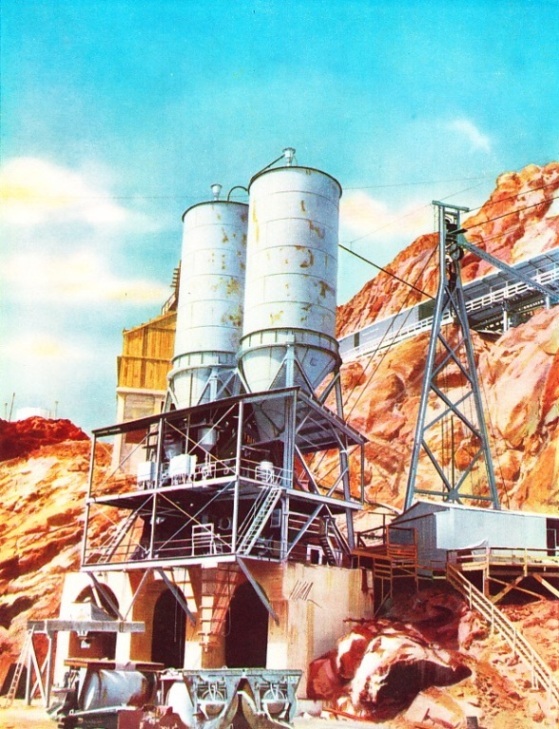 The colour plate accompanying this chapter reproduces the cover of Part 26, which is based on a remarkable photograph of one of the huge concrete mixing plants used in connexion with the building of the Boulder Dam. 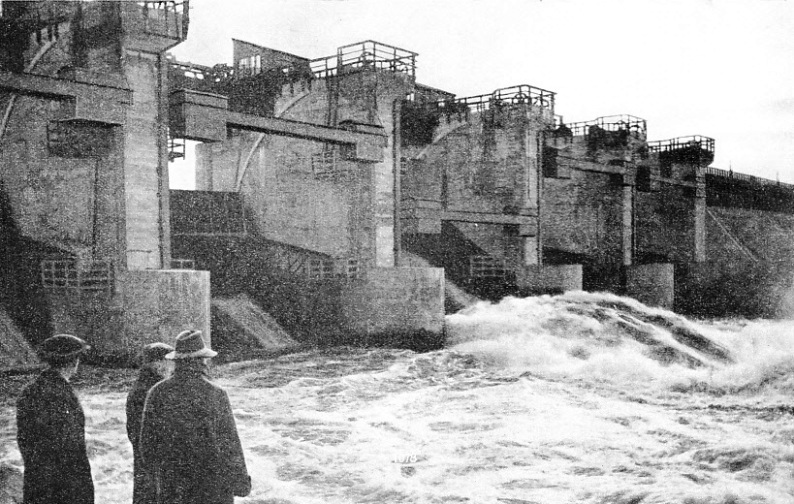 FLOODGATES IN THE CONCRETE AND TIMBER DAMS control the flood waters of the White Sea-Baltic Canal system. Some of the fifteen dams in the area are being used to supply electricity for the industrial development of Karelia and for the electrification of the Murmansk Railway. The highest engineering skill is required for the design and construction of the huge locomotives which haul heavy trains at high speeds across the North American continent. Rail transport in America has many distinguishing characteristics, entailed by the vastness of the continent. From the Atlantic to the Pacific is a distance of more than 3,000 miles, and every day huge freight trains, sometimes of 4,000 tons or more, speed across the plains and hills, over the Rockies and the Sierras. The heavy loads, the long distances and the desire for speed have produced the largest and most powerful locomotives in the world. A striking difference between American and British locomotive building is to be found in the frames. British engines normally have plate frames of rolled steel. In the United States use is made of bar frames, resembling girders built up of rectangular-section steel bars. The bar frames, with the cylinders, the cross-ties and the horns carrying the axle boxes are comprised in one enormous casting. This chapter, by F E Dean, describes in detail how these mammoths of the American railroads are built. This is the fourth article in the series Marvels of Modern Transport. You can read more on Giant American Locomotives in Railway Wonders of the World. Marine engineering practice, similarly to many other branches of engineering, no longer follows precedent. Not long ago the recognized propelling machinery for the coasting vessel was a steam engine with boiler. To-day the heavy-oil engine is often fitted. 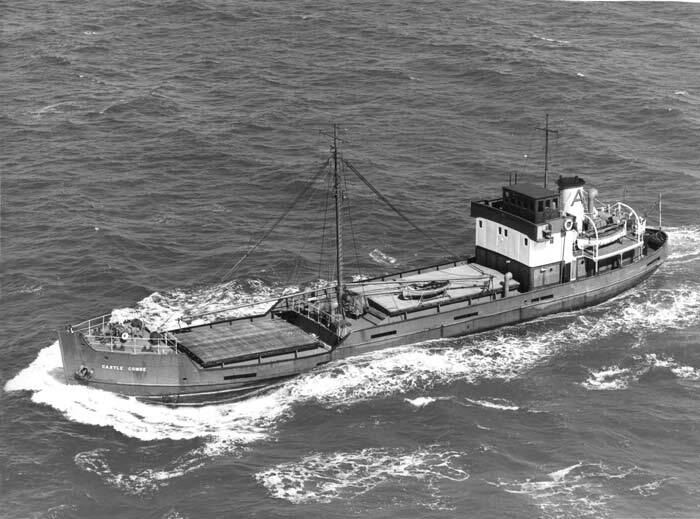 An excellent example is the motor vessel Castle Combe, a cargo vessel of 454 tons gross, 155 feet long. 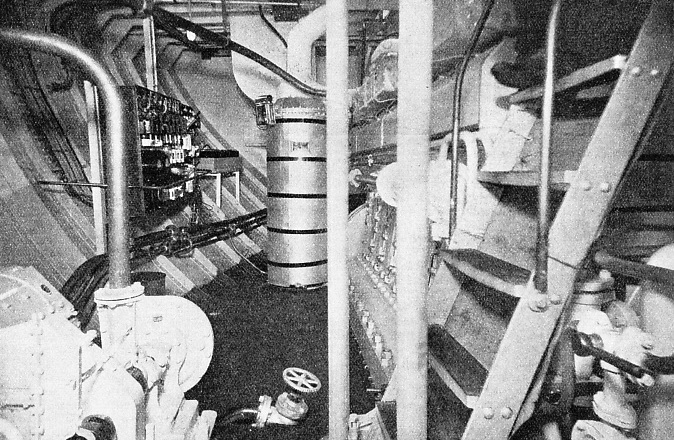 A view of her engine-room is shown below. There are no boiler-room or coal bunkers and the space thus set free gives more room for cargo and provides much better accommodation for officers and crew than is found in a steamer. Clean, roomy and well-lighted, the engine-room is a great contrast to the crowded, hot engine-room and stokehold of the old-fashioned type of coaster. In the centre of the engine-room is the main propelling engine, seen to the right of the illustration. The engine runs on heavy oil and is a Ruston seven-cylinder internal-combustion engine developing 500 shaft horse-power at its normal speed of 430 revolutions a minute. This speed being much higher than is suitable for driving the propeller, the engine is arranged to drive this through a reducing gear so designed that the propeller runs at 172 revolutions a minute, which gives a speed of just over 10 knots. The object of installing a high-speed engine is to get more power in less space. The cylindrical tank seen at the far end of the engine-room is a boiler through which the exhaust gases from the engine are passed on their way to the air. This arrangement gives a supply of hot water throughout the vessel for cabin radiators and the like. In port, when the main engine is not running, the water is heated by electric-immersion heaters. The smaller engine seen to the left is a Ruston four-cylinder oil engine developing 30 horse-power. It drives an electric generator providing current to the electrically driven capstan and winches on deck; it drives also a bilge pump, a ballast pump, a stand-by lubricating oil pump and an air compressor which supplies compressed air for starting the main engines. The switchboard is seen behind this engine. The main engine drives, in addition to the propeller, two bilge pumps, a circulating pump for the cylinder cooling water, a dynamo for lighting the vessel, a duplicate starting air-compressor and two forced-lubrication pumps. The duplication of some of the services is provided so that they can be run by the auxiliary engine when the main engine is not working. Electrically driven deck machinery, electric lighting and hot-water radiators are in great contrast to the old leaky steam winches, the dim, smoky oil lamps and the ineffective stoves of the old-type ships; but these modern appliances are not the only modern things in the Castle Combe. The galley has an oil-fired cooking range and there are other conveniences. The hull, too, is modern in that electric welding has been used to a large extent in place of the old-time riveting. This is the twentieth article in the series Modern Engineering Practice. WASH MILLS in a cement factory. 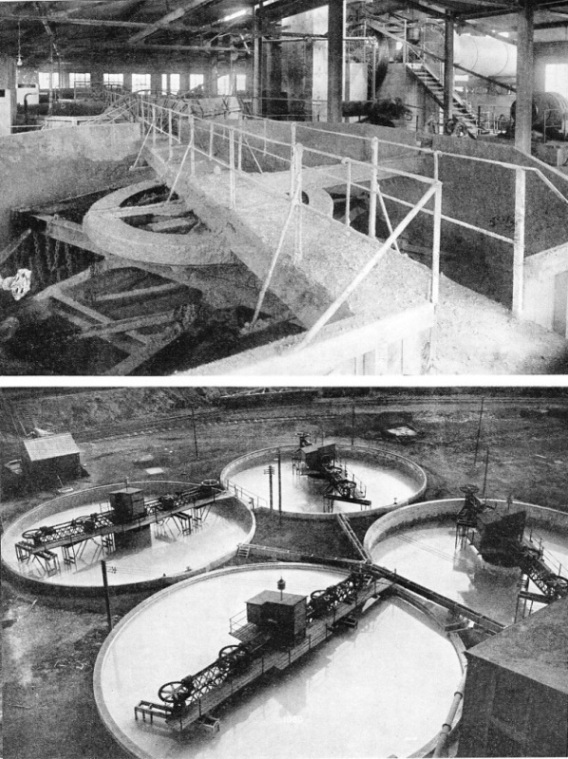 A wash mill consists of a large pit, lined with bricks or concrete, in the wall of which there are gratings through which the raw materials pass when they have been sufficiently reduced. Above each pit is a bridge which carries the upper end of a vertical post, pivoted in the centre of the pit floor. Radial arms carrying water sprinklers project from this shaft, and the shaft is rotated until the contents of the mill form a creamy mid or slurry. SLURRY MIXERS, in which rotating arms and a compressed-air agitating device keep the material in an adequately mixed condition. After the mixing of the raw materials has been completed, the slurry is pumped into kiln feeders for calcining, the next stage of the process. 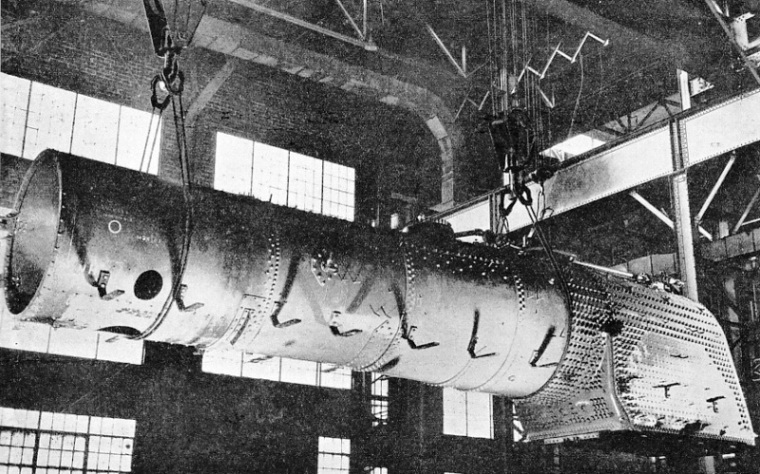 IN THE ERECTING SHOP of a locomotive works at Philadelphia, Pa., A huge boiler is suspended from the overhead travelling crane, ready to be lowered on to the locomotive frame. The boiler shown is for a streamlined engine of the New York, New Haven and Hartford Railroad. 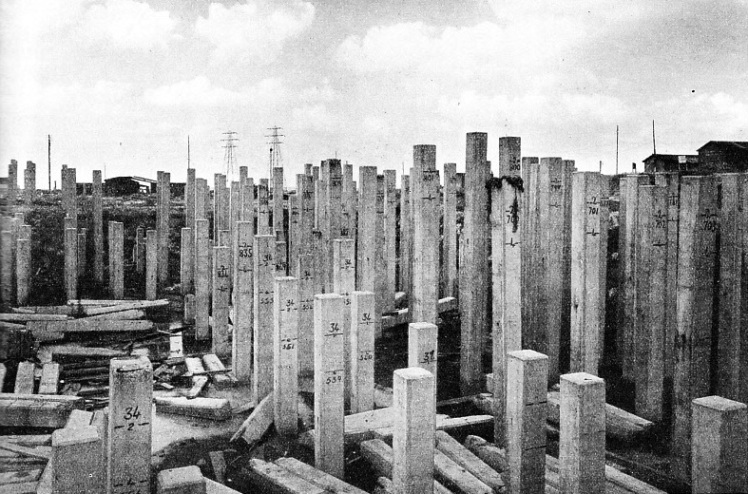 REINFORCED CONCRETE PILES used for the foundations of the great electricity generating station at Barking, Essex. Reinforced concrete piles made from a material known as high-alumina cement can be driven less than two days after moulding. The reinforcement takes the form of steel rods or mesh embedded in the concrete. DOUBLE HELICAL PINIONS (far left) cut out of solid high-tensile steel forgings are used for actuating the rolls of steel-rolling mills. The power is supplied to one of the shafts by an engine or electric motor and is transmitted to the other by the pinions working in mesh as shown. Extremely heavy loads are carried by the teeth. DOUBLE REDUCTION GEAR (left) for transmitting the drive of a fast-running electric motor to a slow-running ball mill for grinding ore. The pair of wheels in the foreground have double helical teeth as they run at a fast speed than the pair in the background with straight teeth, which are satisfactory at comparatively low speeds and are more readily cut. Disaster befell the first great viaduct across the Firth of Tay, but the engineers, undaunted, succeeded in building a new bridge, more than two miles long, across the windswept waterway. The bridging of the Firth of Tay is a story of ultimate success after a disastrous failure in a battle against the forces of Nature. The disaster which overtook the first Tay Bridge was caused by the underestimation of the force of the wind which suddenly sweeps up the Firth in a winter gale. The engineers who built the new structure, more than two miles long, succeeded in overcoming the great stresses which are imposed by the strongest gales. This chapter is by C Hamilton Ellis and is concluded in part 39. It is the thirteenth article in the series Linking the World’s Highways. CONCRETE MIXING PLANT used during the building of the Boulder Dam (see pages 47-58), one of the largest concrete structures ever built. Altogether, including subsidiary works, about 4,000,000 cubic yards of concrete were required. This amount involved the consumption of 755,360 tons of cement and the use of many mixing plants. Compressed air was used to force cement from the silos through pipes to the containers of each mixing plant. In one instance the pipe was 5,600 feet long (over a mile), and the cement was delivered to the container at the rate of 76 tons an hour. This colour plate previously appeared on the cover of part 26. SEVENTY-FOUR SPANS, excluding the approach spans, form the second bridge across the Firth of Tay. The bridge has a total length of 10,711 feet, or 2 miles 50 yards 1 foot. Its building occupied nearly five years and it was opened for passenger trains on June 20, 1887, having cost £670,000, or about £62 10s a foot. This photograph was taken shortly after the bridge had been opened. Large wheel at the left regulates the motion of the blank in keeping with the motion of the teeth. The bar in front of the machine is removed when a spur wheel has to be cut. The seated man gives a good idea of the size of modern machine parts.